“Bring in the designer. We really need to make this shine.” Maybe you’ve heard this in a meeting room, or perhaps you’ve been the designer on other side of this request. Imagine a home built without an architect. The crew checks all the boxes, brings in an interior designer to “pretty things up” with a few antique vases, a rug that really ties the room together—you’ve got yourself a home. Never mind if the shower is in the pantry. When building custom software, such logic should be thrown out of that newly framed window. Too often, design is managed as a selectively leveraged service rather than as a full participant in the product development lifecycle. 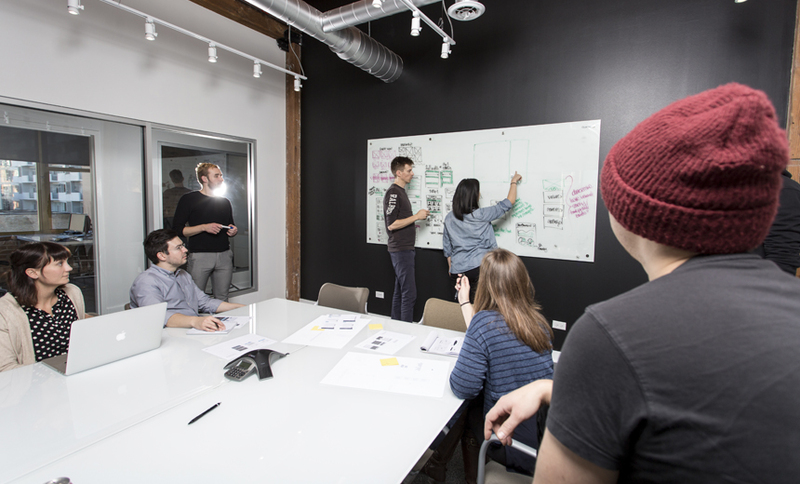 This article will analyze the role of design on a product team, and how the role of design can catalyze those teams and provide immediate business value. When someone hears about design, they might imagine the advertising golden age. You’ve probably seen it on Mad Men: A challenge is presented to “the creatives,” they slip behind a curtain, apply the “magic design dust” that they infamously refuse to share, and reemerge with a dramatic, “grand reveal” design. The suspense and tension (not to mention liquid lunches) make for great TV, but not software delivery. Luckily for him, Don Draper didn’t build his sterling reputation on software delivery. There’s a well-known term for his approach in the world of software… it’s known as traditional Waterfall delivery. This approach postpones encountering risk and consequences to the last possible moment, and fails to realize any incremental value. Regarding design as integral to the product from the outset allows you to encounter the risks and complexities throughout the project, rather than at the tail end. By learning, building, and measuring progress iteratively, you realize value throughout development rather than in one fell swoop at the end. This approach is the cornerstone to Agile delivery. As added value, the perspectives of product, design, and engineering are engaged as equal collaborators in strategy rather than as a rag-tag committee signing off on every minute decision. There isn’t a magic recipe for the makeup of a delivery team. 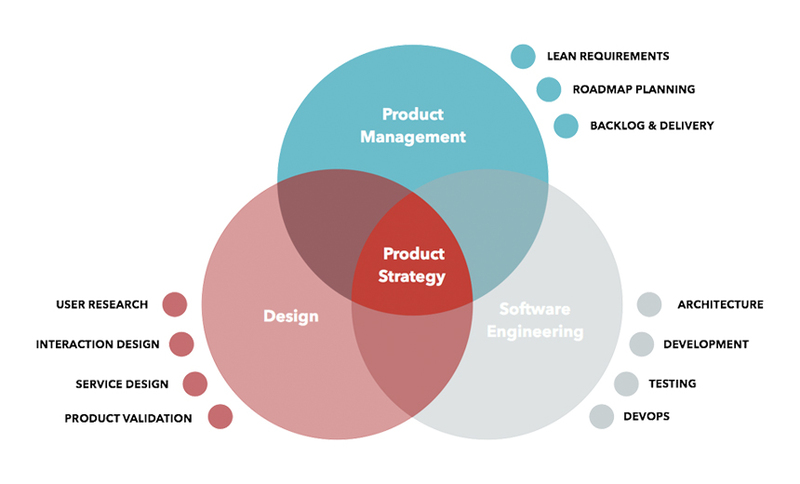 However, all successful product teams engage product management, engineering, testing, and—last, but not least—design.  Why embed design on your product team? A product designer provides curiosity, humility, advocacy, and a healthy mix of ego and charity to the team. They balance the needs they’ve gathered from users with the requirements presented by the business. As a steward of these dynamic and shifting groups, designers find the route that drives the most value for all parties involved. 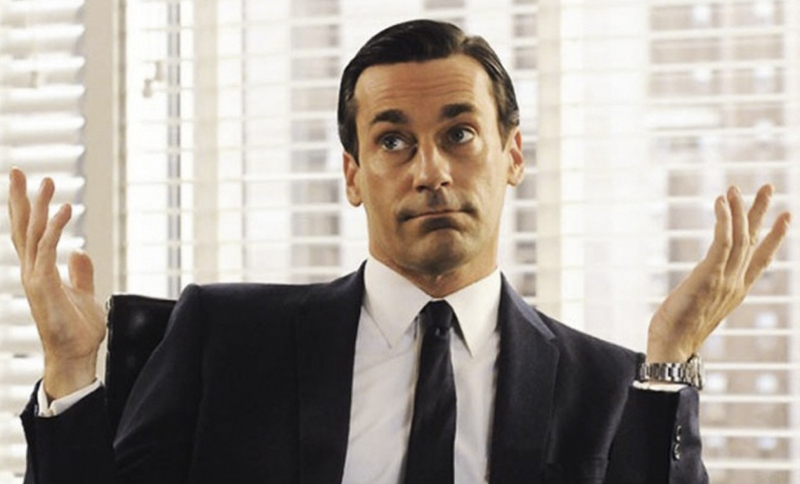 Product design stewardship should not be confused with sole proprietorship—Don Draper-esque visionaries. Instead, designers should work alongside cross-functional teams, managing the variety of concerns each role presents and focusing on delighting the user through the solution created together. The journey to this solution is shared, and with that, insight that might have otherwise been missed is incorporated into the shipped product. For these teams to be effective, clear communication and stewardship are not enough on their own. The organization’s leaders must ensure that open collaboration is encouraged and expected. In order to create the greatest chance for success, these leaders should charge teams with a vision and goals without prescribing specific direction. Each role, therefore, effectively has a stake in the product and participates fully in the team’s challenges and wins. Just as each role has a stake in the success of delivery, so too must the designer take ownership. A designer’s role is to embrace transparency into their process and openly communicate with their colleagues on the risks and learnings gathered throughout the delivery process. Just as an architect is present at the construction site, so too should designers be familiar with the approach and thinking of their team. This means taking responsibility to monitor and evaluate the design throughout its development from start to finish. Finished? That’s when the shipped product is in the hands of the user, not when a mockup has passed stakeholder review. Designers are charged with keeping the user’s needs central to the product team. The work of a designer is enhanced by the pillars of each delivery discipline. Part of why organizations develop a perception that “design is magic” is because they recognize the value but can’t describe to someone else how that value is derived. This reputation is perpetuated by made-for-TV moments like when Don Draper reframes Kodak’s slide projector as a carousel—those in the room aren’t meant to understand the process and iteration that created this solution. This risk-filled meeting will drive a plot forward but won’t always deliver for the product. A collaborative cross-functional team must move past flourish and focus on the outcomes they are looking to generate. These outcomes should drive conversation, and the team should own the story of product evolution. Successful designers pair with product managers on the evolution of requirements, work with engineers to understand the impact of interaction on delivery, and consult with testers to maintain the overall usability and accuracy of the design in production. True product strategy is rooted in this approach. When fully integrated within a team, designers fully realize the value of their product, engineering, and testing colleagues. At Devbridge, this approach to product strategy defines the way our cross-functional teams collaborate throughout discovery and delivery. We balance the concerns of product and engineering by managing engagements through a dual-track backlog, prioritizing business concerns and hypotheses alongside a backlog for stories to be delivered. Healthy product organizations are better at mitigating risk, identifying opportunity, and balancing business and user value. This health can be nurtured through an environment where shared knowledge and collaboration is encouraged—cross-functional lunch-and-learns and training across disciplines are just two ways this can be achieved. These shared knowledge opportunities help create a culture of taking ownership where the role of design is anchored to the delivery effort. Clear and open lines of communication are essential. The people in each role must be able to easily collaborate their team, which goes beyond a simple seating chart adjustment. Communication is especially important in organizations that see distributed design teams across various product efforts. Whether it’s supporting design systems, career development, or maintaining the culture of a team, the needs of an individual designer shouldn’t be mortgaged for short-term gains. Design offers the check-and-balance every product team needs. Embracing product design results in better products that focus on the user and minimize risk. By including your entire team when the plans are drawn up, you’re more likely to arrive at the destination of your product dreams. Whether you’re at a tier-one bank or part of the proverbial “team in a garage,” cross-functional teams are the best equipped to ship differentiated products to market. That differentiation is rooted in embracing feedback, trusting the expertise of your team, and shipping product to market. Learn and iterate as a team, and entrust the designer in your product life to drive the solution to a valuable place. The next time you set out to build something great, save on expensive remodels and embed product design from the start.